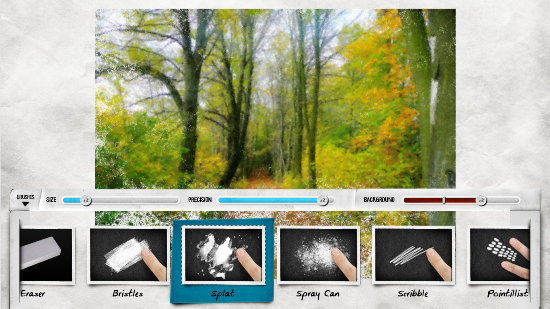 There are many cool smartphone apps today that convert images into something arty. If you’ve used Instagram or Camera 360, you will know what I’m talking about. I was lucky to chance upon a cool app in the Windows Store called Lazy Paint that converts photos into really cool art. 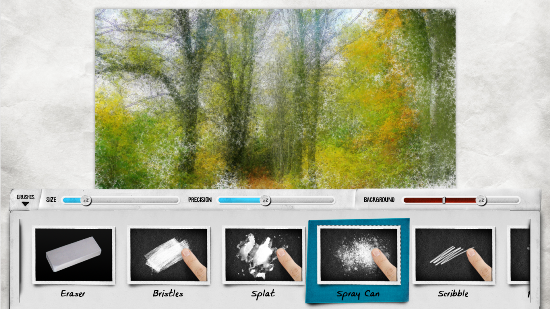 Lazy Paint is actually a teaser to the real thing that developers Psykopaint intend to create for tablets, but it’s a fun way to de-stress and paint without a care. There are no paints, no canvas, no messy palettes, and no pressure! Lazy Paint claims to be the perfect tool for people like me who are simply too lazy to learn art or who just don’t have the talent for it. The tool works great on a touch screen, but if you have only your mouse pad for support, you can use the right-click menu to bring up the brushes and options you’ll need to get started. Once you have downloaded and installed Lazy Paint right-click the screen to display its options. You can initially start off with a sample image that is preloaded. Or you can simply capture an image from your camera, or upload one from the library. Once you have selected the image of your choice. all you need to do is select a brush and start dabbling. The resultant is a beautiful work of art that you can be proud of. You don’t need lessons in selecting the right brushes, understanding what primary and secondary colors are, or spend hours analyzing works of art to create your masterpiece. Lazy Paint does all the work for you, and yet you get the satisfaction of creating something unique. Painting has never been such fun! 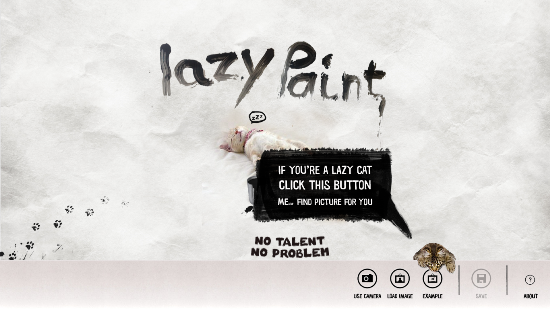 Check out Lazy Paint on Windows 8 here. If you haven’t got access to the Windows Store, check out the web version here.